The Wheelchair Delivery & Collection Service covers areas including, Bristol, Bath, Weston-Super-Mare, South Gloucestershire, North Somerset, Cheltenham, Gloucester,Twekesbury, Radstock area and the Forrest of dean. Collection and/or delivery will be arranged with you. 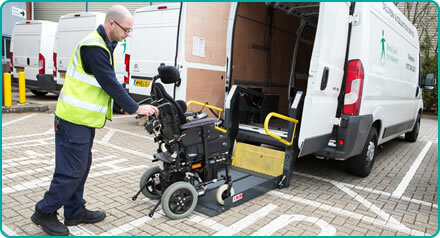 The Wheelchair Delivery & Collection Service delivers wheelchairs and Orthotic parcels that have been issued by the Wheelchair & Special Seating Service to users’ homes, place of work, day care centres, and respite care places. The service also delivers wheelchairs to your home, on behalf of the Wheelchair Service, for demonstration and assessment purposes. They will also ensure any speciality items from your old wheelchair that are required are transferred to your new wheelchair, e.g. modified arm Pads or back supports etc. The Wheelchair Delivery & Collection Service collects wheelchairs that are no longer required by you including wheelchairs that are worn out, too small, too big, unreliable or where the user is deceased. Wheelchairs issued by the NHS remain the property of the NHS throughout their lifespan and should always be returned when no longer used or required by the user they were issued too. If we try to make a delivery or collection and you are not available we leave a card with a direct telephone number on it for you to rearrange.